SNEHA’s 16 days of activism this year will be using Theatre of the Oppressed – a form of popular community based education developed on the vision of Paulo Freire and his landmark education Pedagogy of the Oppressed. 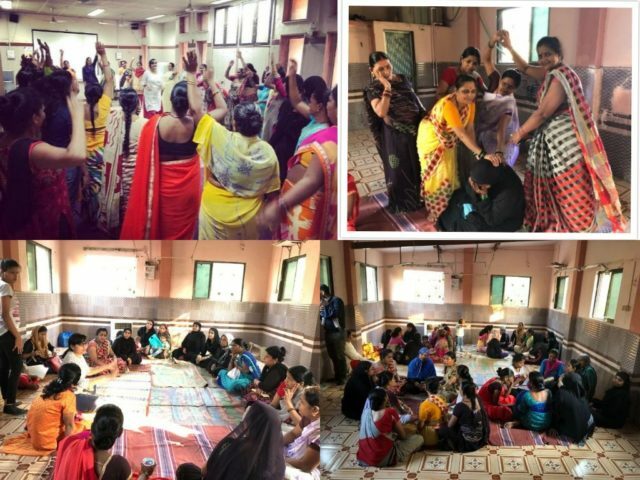 Our trained Women Community volunteers called ‘Sanginis’ from informal settlements (slums) of Dharavi and Govandi in Mumbai, India are trained to provide immediate crisis intervention in cases of domestic violence in their community. They have been given smartphones with a crisis intervention app called Little sister app, which captures real time violence. Our team of counselors and lawyers working out of the community Centres/hospital provides psycho social legal support to the survivor. The community volunteers will be trained in Theatre of the oppressed and will perform Forum Theatre on bystander intervention at Dharavi, Govandi and Wadala slums in the month of December 2018.